I’ve posted before about the advantages of self-catering. I used to think it was a ‘poor man’s option’, but, about five years ago, I changed my opinion completely. You can eat what you like, where you like, without the constraints of hotel dining room opening times and menus. But, if you cook for yourself, you do have to do the washing up afterwards. 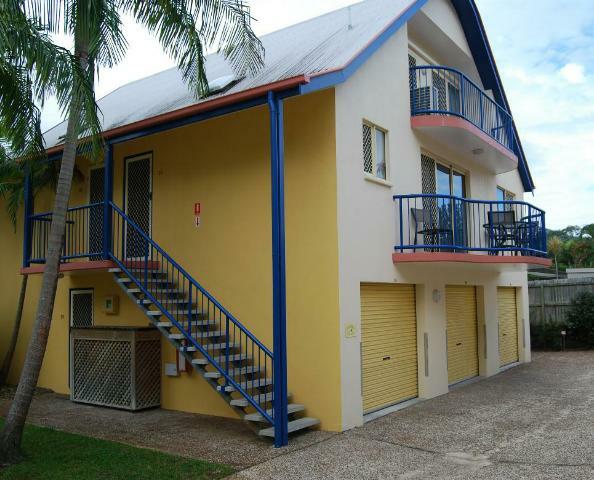 We stayed at three such facilities during our stay in Queensland, and Rainbow Getaway was the one we used in Rainbow Beach. I’m not sure ‘hostel’ is exactly the correct word to describe this kind of place. The word conjures up visions of low-budget, dormitory-type accommodation for backpackers, but this is suitable for families, too. Our unit had two floors, and consisted of 3 bedrooms (one ensuite), a bathroom equipped with spa bath and shower and a spacious lounge/kitchen/dining room. A garage is available, if you have a car, and additional parking space can be arranged if you have more than one. The management can arrange any tours you wish to make, and most operators will pick you up from the entrance of the complex. The apartment was equipped with everything you’d need for a long stay, including a dishwasher and washing machine. Paid wi-fi was available, and, if you didn’t bring a computer, you can use the one in Reception. We didn’t use the swimming pool … it was, after all, the middle of winter, but it was available if we wanted it. Most importantly, there were a number of food outlets within easy walking distance, if you didn’t want to cook your own … and, if you did, there’s also a handy supermarket from which supplies could be obtained. And, wouldn’t you know it. There was a bakery selling … more Famous Pies! Sounds Ideal, wow and 3 bedrooms, more than enough room. It seems it had everything that you would need. Nothing nicer than a spa after a long day, it certainly seems like a really nice place to stay, with everything so close. When I ‘discovered’ self-catering on Crete (see https://travelrat.wordpress.com/2007/09/03/sleeping-and-eating-in-crete) we did get ‘room service’. There were 6 of us, so we needed the 3 bedrooms, but 1 and 2 bedroom apartments are also available. I prefer scouting for food than being served at a hotel. There are many foods waiting to be discovered outside the hotel resto and/or cafe and they’re worth the try! In Asia street food is the best! The place you stayed in looks cozy. I am sure you had a lovely stay. I think the reason most people accept a ‘full board’ tariff in many places is perceived language difficulty. I know Bill Bryson once said ‘Don’t eat where they show you pictures of the food’, but if I don’t speak the language, I’ll often break that rule … you can do a lot with a pointing finger.